North Stars BOM by Elizabeth Hartman 82" x 82" All pieced blocks - no applique or paper piecing. 10 month program $ 19.99 sign-up, $ 19.99 per month. Each block measures 24" finished and includes the fabric to finish as a 9-block quilt. 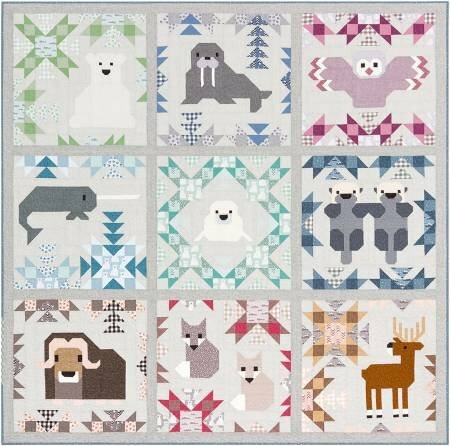 Meet Patty Polar Bear, Willa Walrus, Owen the Owl, Neville Narwhal, Lucille the Seal, Olive & Oswald Otter, Meredith Muskox, Fritz & Fred Fox and Reggie Reindeer. The blocks could also be made into three smaller 4-block quilts or individual minis or pillows but may require additional fabric.